If you have ever been to the Feeder Canal, near Lock 6 of the C&O canal, then you most likely have seen Ashley Nee. This is where she trains with the US National Canoe/Kayak Team, usually paddling twice a day. When not paddling, you might catch her running with her dog. Ashley leads the LAKS Winter Slalom program, teaches Pool Rolling, and works with the Youth After School Program. A DC area local, Ashley was introduced to kayaking at age 10 while she attended Valley Mill Camp. She began racing slalom soon after. Ashley has been on the US National Team for three years and the Jr National Team four years. She was the 2010 National Champion, won the US Team Trials in 2011, and Olympic Trials in 2012. She competed in the Rio Summer Olympics, placing 14th. 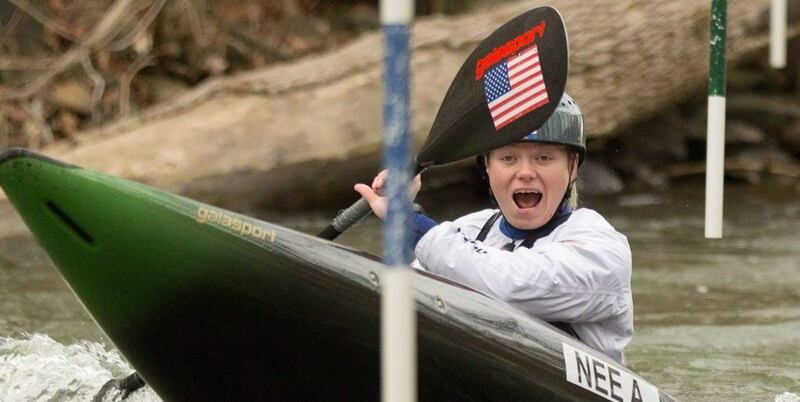 Ashley still lists among her biggest achievements the Penn Cup championship and Valley Mill’s Whitewater Award. Other than slalom, Ashley likes to teach Beginner classes, Pool Rolling, and any time she gets to surf. She loves to work with kids. When asked why she responded, “because it’s so fun!” Well, yeah! You will be able to find Ashley surfing at Rocky Island anytime the level is right. According to her “perfect Rocky” is 4.14. And, yes, she will probably still be down at the Feeder!